I have joined Gould’s ‘Family History Through the Alphabet’ challenge a little late. I can’t promise to participate for every letter (my track record for sticking with challenges is not good!) but I didn’t want to miss out on the fun. Here is my contribution for the letter C.
Cooper: A craftsman who makes and repairs wooden vessels formed of staves and hoops, as casks, buckets, tubs. "cooper, n.1". OED Online. March 2012. Oxford University Press. http://www.oed.com.rp.nla.gov.au/viewdictionaryentry/Entry/41028 (accessed May 24, 2012). My ancestor, Robert Couper (1825-1898) was a cooper. Although the surname Couper has occupational origins, he was not from a long line of coopers. His father was a shoemaker; his grandfather a farmer and fisherman. Robert worked as a cooper both in his native Scotland and in Australia, having immigrated in 1852. 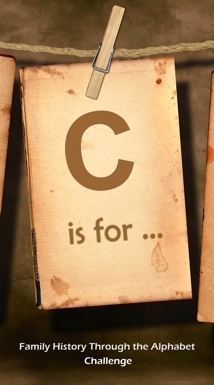 As well as working as a cooper, he was also a (c is for) contractor. I suspect that he is the same Robert Couper who supplied timber for some government road contracts. Related to the occupation of cooper, he possessed a beer licence. I couldn't resist joining in either, Shelley. Let's just do what we can manage and not make it a chore. Shelley, welcome to the Challenge, and thanks so much for your contribution. I'm hoping to do an occupational post for one of my reli's in a future letter. And please don't feel you need to do every letter, just join in as you wish. Liked the beer licence bit. I have a couple of folks in my tree who were coopers by profession. I will have to take a look and see if they put their barrels to a similar use. Another great thing that I love about Genealogy is that I learn so much about other things. Thanks Shelley.